We have experienced roof cleaners who will effectively eliminate mould, lichen, algae, unpleasant stains and moss from rooftops. We are a sought for nearby house roof cleaning firm that will make sure that your roof covering looks nice and it's safe from destruction caused by all the residues and detrimental growths which get amassed on it. We use powerful pressure washing equipment for flawlessly cleaned roofs. Ou prices are fixed and pretty acceptable. For efficient and outdoor roof, window and gutter cleaning in the area - make a booking for our cleaning services right away! It's good to clean your gutters at least once every year, to avoid gutter and downpipes clogging and water damage to your building. Ashlee House Cleaning has vetted, skilled and experienced gutter cleaners who can efficiently clean out any leaves, dirt, twigs and other debris. 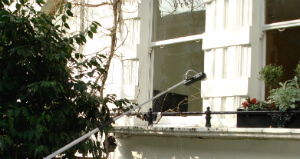 They will ensure that you get your gutters clean by using telescopic pipes with attached cameras, connected to powerful dry or water vacuum cleaner. You will see before and after photos of the condition of your gutters and downpipes. This service is offered with a 1 month quality guarantee, and we will come back to clean again if they get clogged during that time. In case there is certainly no company, who are able to care of your commercial building windows, possibly, the enthusiastic experienced window cleaners in Highbury N5 are right here to help you. We are at the same time available for industrial window cleaning services in Highbury N5. All kind of industrial properties are accepted: restaurants, hotels, offices, IT buildings, stores. Note that our special safe system for gutter and window cleaning can reach up to fourth floor. Conservatory window cleaning requests are also accepted! We have developed a procedure for quick and effortless bookings for our window cleaning Highbury N5 service. All you need to do is get in touch with our customer support service at by calling 020 3746 1366 or using the online reservation request form. Decide any day of the year for the cleaning. Our window cleaners will certainly carry out their job at predetermined and acceptable prices. We will not ask you for a deposit. You will get an email or text message confirming your booking in the next 2 hours. For booking more than 1 of our services simultaneously, we will encourage you with a price reduction of up to 15%.